Five years ago its students were struggling. Today, innovative teaching methods based on activity-based learning have taken Tamil Nadu to the top of the elementary education charts. The Panchayat Union Primary School in Kumaran Kottam village, 55 km from Coimbatore, does not fit the stereotype of the average Indian school. It has no tables, no chairs and no regular classes. Teachers sit on the floor. Students do likewise, in little circles. In some rooms, students from different grades sit together. All of them are busy. Some write on low blackboards, some draw, some use an abacus. In one room, a puppet show exposes the pupils to mathematical tables… This is the world of activity-based learning (ABL), an initiative that has transformed elementary education (classes I to IV) in Tamil Nadu. ABL, based on the pedagogical principle of learning through activity, was launched across Tamil Nadu's 37,486 government and government-aided schools in 2007/08. It has catapulted the state to the top of the elementary education charts, going by surveys conducted by the National Council of Educational Research and Training (NCERT). 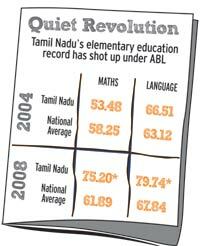 In 2004, Tamil Nadu's students' performance at the elementary level was below the national average. Students in Class III scored just 53.48 per cent in NCERT's mathematics test. In 2008, just a year after ABL was introduced, this score jumped to 75.20 per cent - the highest in the country. The same is the case with language (Tamil) and other subjects. All this has been achieved with no extra budgetary support from the state. The success is not restricted to just academic outcomes. Surveys have found that the children have greater self confidence, higher levels of motivation and less fear of exams. Take the case of S. Surendar, who was in the first standard in 2006/07. Teachers at the Rani Meyammai Primary School in Chennai's Adyar locality were at their wits end as he constantly cried in class and failed to master basic skills, especially in mathematics. "ABL transformed this boy. The activities got him interested and he began learning very quickly. Today he is in the seventh standard and among the toppers in his class,'' says N. Manimekalai, headmistress of the school. ABL has spawned many Surendars, she adds. The story was very different in 2005, when an NCERT survey left officials in Tamil Nadu's Elementary Education Department stunned. It revealed that 65 per cent of Class V students in government and aided schools did not have a grasp of basic mathematical skills such as addition and subtraction. Thirty five per cent could not read or write in their first language, Tamil. The survey triggered some soul searching within the state government, which, back then, spent close to Rs 4,000 crore annually on elementary education alone. The state provided excellent school infrastructure, had enough teachers and low student dropout/absenteeism rates. And yet, its students were performing poorly. For M.P. Vijayakumar, an Indian Administrative Services (IAS) officer, the findings proved to be a blessing in disguise. Serving as Commissioner of Chennai Corporation at the time, he had designed and implemented ABL to good effect in the 264 schools that the local body administered. And he would spearhead its adoption and implementation in state-run and aided schools across Tamil Nadu. "When I heard of the government's predicament, I invited myself to the executive committee meeting of Sarva Shiksha Abhiyan - Tamil Nadu held towards the end of 2005. I convinced the committee that the classroom process was the problem." The problem, he said, lay in the teaching method, which focused more on rote learning (see Traditional Teaching). Vijayakumar, who has since retired, is currently a member of the National Resource Group of the Ministry of Human Resources and Development's Sarva Shiksha Abhiyan programme. 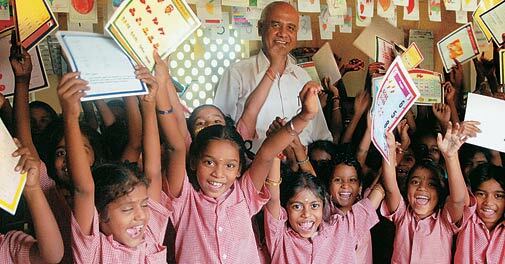 Vijayakumar had actually woken up to the shortcomings of the elementary education system during a stint as Collector of Vellore District in North Tamil Nadu in 1993. The administration at the time was implementing a programme for abolition of child labour and bonded labour - notorious in the district's beedi factories. Officials found the 6,000 or so children weaned out of the drudgery of beedi-making struggling to cope in non-formal schools. These schools had been set up especially for the children, to prepare them for a return to mainstream schooling as their education had been disrupted. Some of the struggling students even went back to work. This made the officials look for an alternative system of education. In Rishi Valley School, located in Andhra Pradesh's Chittoor district, they found a system that was being put to effective use among tribal children. "The basic philosophy of that system is that children do not learn by listening alone. They also learn by doing, experiencing and reflecting. We borrowed this idea and introduced it into our non-formal schools,'' says Vijayakumar. Numbers, for instance, were taught as rhymes or through activities and games. The core philosophy was to help students act and think independently, avoid rote learning and solve problems creatively. The children loved these methods and were quick to learn. They began to excel in the formal schools as well. This made the team from Tamil Nadu question the efficacy of the formal schooling system and consider taking ABL to regular schools. Vijayakumar got the opportunity to implement the system in Chennai when he took over as Commissioner of the city corporation in 2003. Teachers were sent to Rishi Valley for training and to prepare teaching material. The national education policy has stipulated that between classes I and IV, a student should acquire 554 competencies, including addition, subtraction, alphabets, forming words, and so on. These were used to draw up various activities. To start with, ABL was piloted in 13 schools in 2003/04. A year later, it was implemented in all the 264 Chennai Corporation schools. The state-wide implementation involved 37,486 schools, 140,000 teachers and three million students. "We had picked up 10 schools in each district to start with during academic year 2006/07, but we had to train the teachers,'' recalls Vijayakumar. So, a massive training programme was started. Over 40,000 teachers were brought to Chennai to train, and to watch ABL at work in the Corporation schools. And teachers from the Corporation schools were sent across the state to train other teachers. But implementing the system across thousands of schools came with its share of problems. There was resistance from some teachers, with a few complaining that they could not sit on the floor. "It was a hassle initially. But once we understood ABL, it gave us freedom,'' says headmistress Manimekalai. A few parents, too, were unhappy with the new system, which was multi-grade, had no exams and no homework. But the students enjoyed it. "Despite facing these issues, we persevered. Political will was the key and successive governments backed us to the hilt,'' says Vijayakumar. The tide turned slowly and resistance evaporated. ABL has sparked another transformation, one that was hard to imagine until recently. It has altered the student profile in government and aided schools, where students by and large hail from poor families. "Almost 20 per cent of our 686 students are from the middle class today. We are even getting students from the nearby convents,'' says Manimekalai. But challenges remain. A recent NCERT study that looked into the efficacy of ABL pointed out shortcomings in teacher training and learning material. It has also raised safety concerns over the plastic beads used in mathematics kits. For now ABL has become a showcase project. The Department of International Development, UK, recently held a retreat for its education officers (from 70 countries) in Chennai to enable them to see ABL at work. Even China sent a team to study the system. In India, it is being piloted across17 states. On the ground, the satisfaction is of a different kind. Says V. Soureeswari, a teacher in the Kumaran Kottam school. "Earlier the focus was on finishing portions. The Social Work and Research Centre, also known as the Barefoot College, works with underprivileged women, helping them build livelihoods within their own communities. The college, which runs entirely on solar power, is located in Tilonia village in Rajasthan, about 95 km from Jaipur. It was set up in 1972 by Sanjit 'Bunker' Roy, a former national squash champion. The name 'barefoot' was inspired by a programme in China, where rural villagers were trained as health workers in the 1960s to assist their own communities. The institution is now administered by the villagers of Tilonia. Over the last four decades it has trained three million women, helping them become school teachers, midwives, health workers, solar engineers, computer instructors and accountants, among other things.